The bestselling and popular Big Berkey water filter system is the perfect water filter for couples in a city flat or small families. The Big Berkey is also suitable when travelling, such as camping in Wales or on a secluded beach in Cornwall, in a caravan touring the Lake District, or during unexpected emergencies whether in a cottage out in the English countryside or in the middle of London. 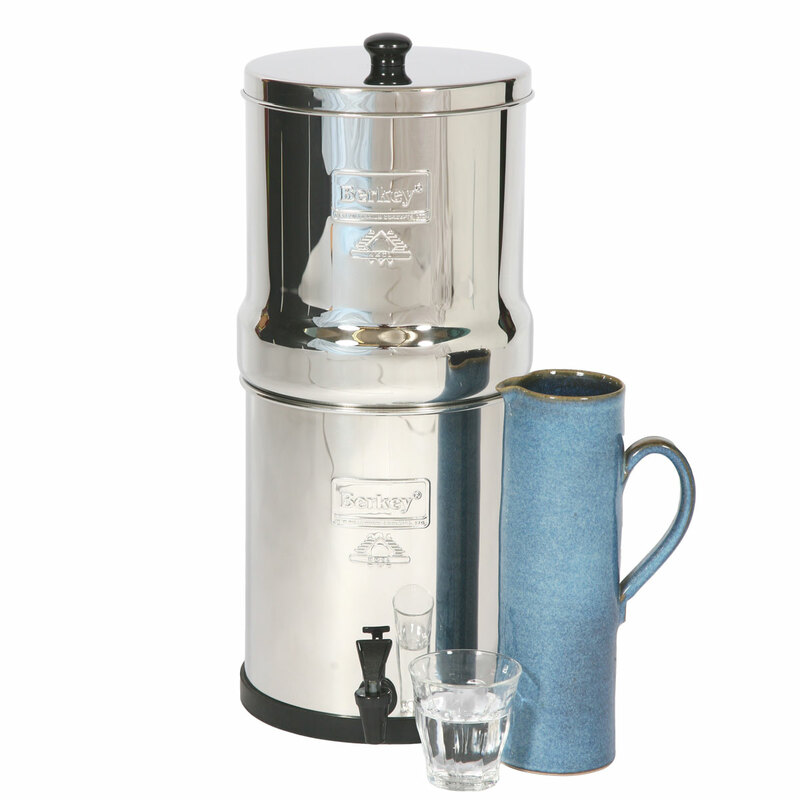 The Big Berkey water filter system may be ordered with your choice of one discounted Berkey accessory. For a description of the various Berkey accessories see: Sightglass Spigot, PF-2 Fluoride/Arsenic Filters, Stainless Steel Spigot, Berkey Replacement Parts, Berkey Stand or Berkey Primer. The Big Berkey water filter will purify your home’s treated tap water as well as untreated water from such sources as lakes, brooks, ponds and water sources in foreign countries, where the local water supply may be compromised or regulations may not be adhered to. 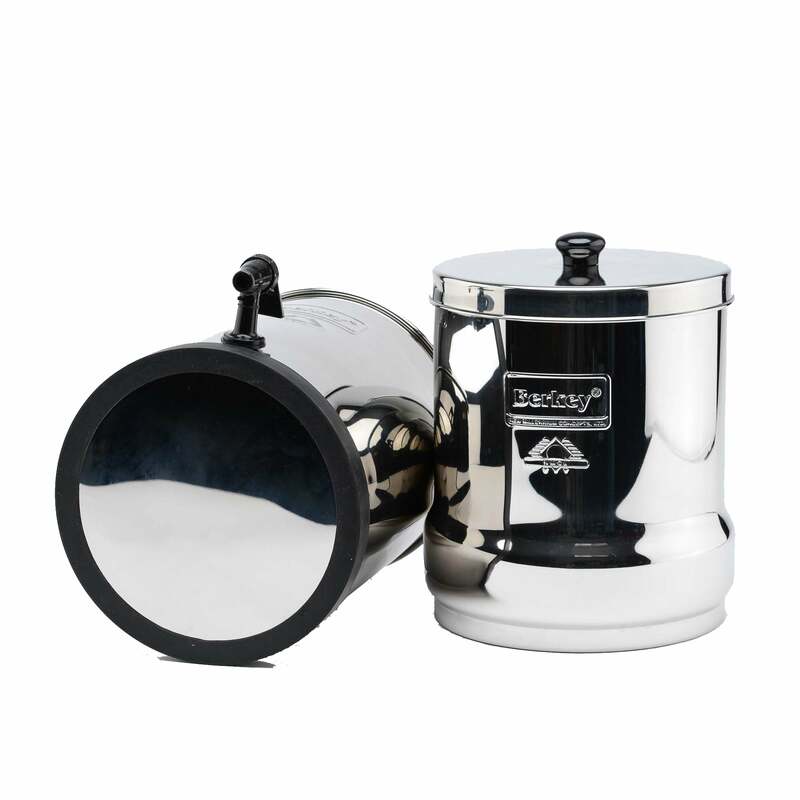 The Big Berkey is the ideal water filter for all outside activities and is definitely a must in inhospitable environments where electricity or clean drinking water may not be at hand. The Big Berkey assembles in minutes with no need for tools, electricity, water pressure, or plumbing. The Big Berkey water filter system eliminates pathogenic bacteria, cysts and parasites entirely as well as removing toxic chemicals such as herbicides, pesticides, pharmaceuticals and all manner of VOCs, organic solvents and trihalomethanes. In independent testing the Black Berkey filters have also been found to reduce nitrites and toxic minerals among others: lead, mercury and aluminum (See a detailed list of which contaminants are eliminated by the Black Berkey Filters). 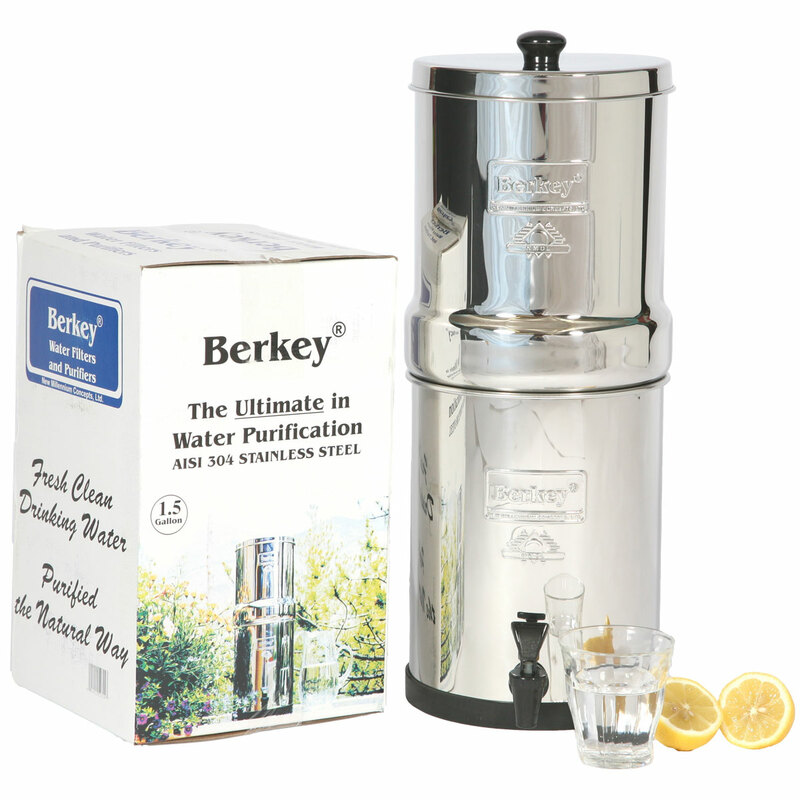 Besides this the Big Berkey water filter leaves undisturbed and intact the beneficial minerals your body requires. 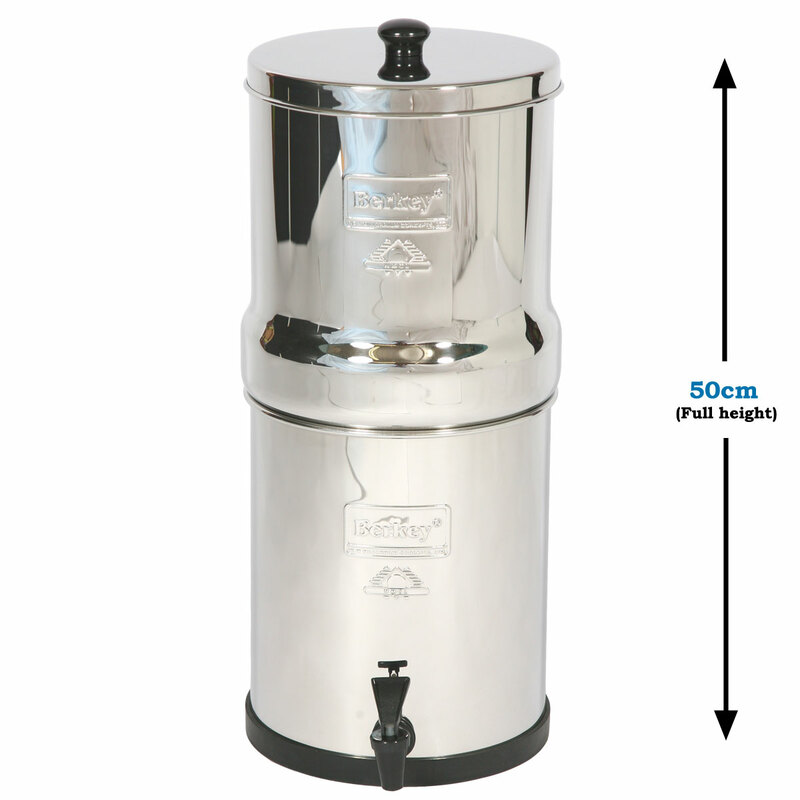 The PF-2 fluoride filters can be attached to the Black Berkey filters for the removal of fluoride. The water in Wales, Scotland and Northern Ireland is not artificially fluoridated. However artificial fluoridation is being applied in some parts of England by local water authorities. The two following links show where artificial fluoridation / high natural fluoride levels are present. The first pdf map shows fluoride levels in England and Wales. The second pdf map gives a county by county breakdown of where fluoridation/high fluoride is to be found in England. 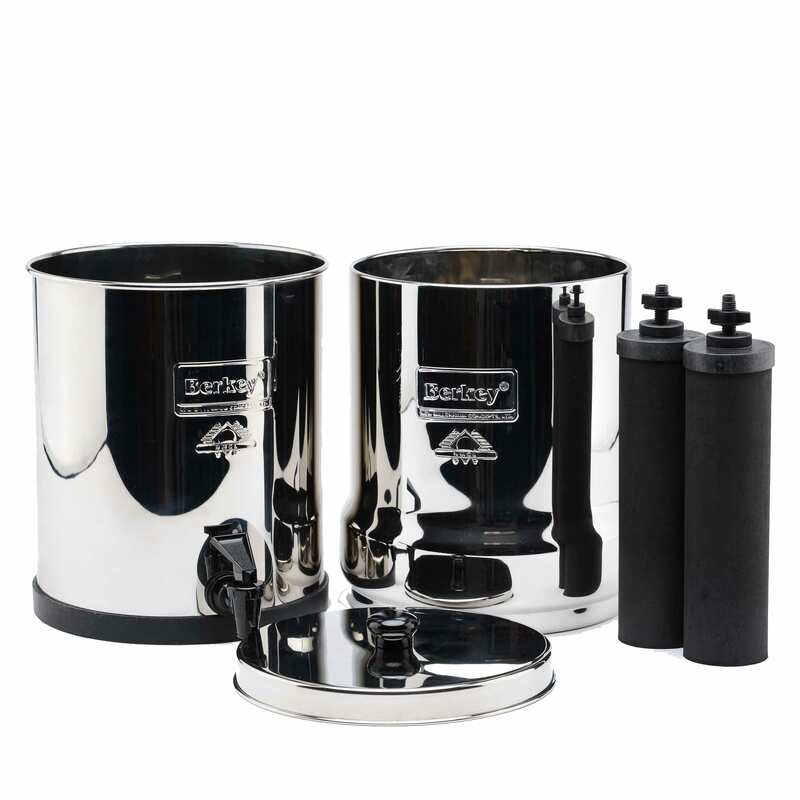 The Big Berkey is manufactured from highly polished 304 stainless steel and the water filter system comes standard with two Black Berkey filters. The upper chamber can be fit within the lower chamber and measures only 33 cm. in height for easy transport.